Hey sis! So, ya landed here because you’re interested in learning how to get started as a Travel Influencer. I know a lot of times it seems as though being an influencer is super lit. The free trips, working with brands, making money online, and living life by your own rules. And It is. Or shall I say, it can be. Before I lay out a lot of the moving parts and pieces in the Ultimate Guide, let me set a few expectations for you Love. (1) It’s hard work: Creating an authentic, transparent, and profitable travel brand can take a lot of work to build. Don't think just because you have a lit Instagram, that it automatically makes you a business or an influencer. It just means you have a lit Instagram. #DasIt. This doesn't mean that companies want to work with you, that people trust your opinion, and it certainly doesn't mean that people are willing to buy from you the most. (2) It takes an investment: Listen. If you are not willing to invest time, resources, or coins to build a profitable brand as an online travel influencer, then hang it up #flatscreen. It doesn't take a lot of money to create a valuable travel brand (it only took me about $350), but you must be willing to be committed to the process. The investment of time it takes to be consistent is what will cost you. (3) You’re not gonna pop off immediately: Beyoncé, Oprah, or Blac Chyna weren't made overnight. Neither will you. So relax and just vibe. Now that we got that out of the way, let's talk about how to get started as a Travel Influencer. Note: Errythang in this epic guide is tried and true by yours truly. Plenty of times I’ve screwed up. But there are more wins that certainly outweighs the L’s. The goal here is to help you fast forward through some of the obstacles, so you don’t have to go through them like me. So often people slide in my DMs or my Inbox and ask to “pick my brain” (note: you can pick my brain here) about exactly how to be a travel influencer. Social Media has this magical way of tricking you into thinking that being an Influencer or creating an online business is just as easy as posting and setting up a website. Let me be the first to tell you that it isn’t - at all. This is an Ultimate Guide to help you get started. If this was the “Ultimate Blueprint to Starting a Successful Online Business so You Can Quite Your Miserable Job, You Hate So You Can Work From Any Beach in The World, While Sipping Ice Cold Coconut Water, While Watching the Sunset,” I'd be a gazillionaire. But this isn’t it Beloved. Everyone gets to the destination differently. Now that we got all of that out of the way, let’s get into the Ultimate Guide, shall we? In this era of “flexin’” for the ‘Gram (or all social media platforms for that matter), it’s hard to sift through what’s realistic and attainable and what’s just “flodging” (look that one up on Urban dictionary folks). It get’s difficult to keep up with something you’re not. By being authentic and telling your story, sharing your passions, and genuinely being valuable to others - you have no choice but to flourish. Granted, you don’t have to have some traumatic or dramatic event to happen to you for people to resonate with your message and brand as an Influencer. Your Story just needs to come from a real place. If you’re a single parent who still finds the time, energy, and balance to travel (with or without a child in tow), then be real about that. Go a step further and tell us about the difficulties, which you need time away from your family, what that does to you, talk about your co-parenting relationship, etc. The ups/downs, challenging, learnings, the wins. You’re a family yet still make it a priority to travel. Talk about some of the concerns you had before traveling, how it is making your family much closer, offer solutions for other families that desire to go yet have no idea where to start. You’re a young, single, woman who was depressed and anxious. Quit your job to backpack through Asia then found herself again (that’s actually my story, and you can read it here). Everyone’s journey is path is different. What resonates with you may not pull at my heartstrings. The point is, tell your story. Don’t omit the parts where you fxcked up either. That’s where the golden nuggets are. Be open. Be honest. Be authentic. Sure, you can’t tell every detail but give your audience enough to feel your vibe. Especially when it comes to creating an online brand, you must create valuable content. Keyword folks - valuable. Even further, video content is king. You probably feel a way about getting your face online. Let alone creating live streams daily or even speaking to a camera directly. Creating a profitable online brand (or any venture) is going to push you to some uncomfortable limits. It’s apart of the process. So the sooner you get your fear and yourself - the better. If creating video is uncomfortable, try practicing by speaking in the mirror. Talk as if you’re chatting with your friends. You can even pre-record videos and content. Then move towards leveraging a platform like Stories on Instagram, Snapchat, and Facebook. Whatever works for you. Do that. Do it well. Do it often. And be valuable. You’ll find what works and what sticks sooner than you realize. Also, once you have created said content, make sure that people continually see the goods through automating how much it shows up. I’ve been using SmarterQueue (free month on me!) for over a year, and I love it! That means, there’s enough for everybody. Even if you had all of the resources, funding, tools, labor, etc., you still wouldn’t be able to reach or service everyone. And you wouldn’t want to! Who wants that type of pressure anyway?! Truthfully, everyone doesn’t like you fa real. And that’s okay. It’s more than okay. Because when you tell your Story, those who ‘get it’ will be magnetized to you. And ultimately, desire what you have to offer. It’s disheartening how people feel there’s so much “competition” in their niches. Many will debate this, but “competition” is a psychological hangup. In this very abundant Universe, there is enough for everybody. 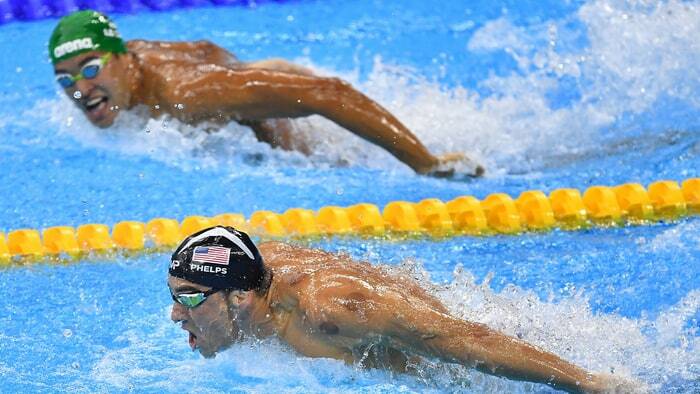 One of the most iconic visual and literal examples of “staying in your lane” is from the 2016 Olympics with Michael Phelps and Chad Le Clos. Back to the point, you really must start where you are. And by this, leverage your networks. When first starting out, I just assumed (and you know the saying behind that), that people just knew what I did. That was a lot of missed opportunities. Use your immediate network to tell folks what you’re doing and working on and ask for support. And by support, it doesn’t always have to be financial (although that’s still welcome), but in different forms. Which can looks like: following on social media, sharing your content, referring you, etc. Even opening your emails to get the Open Rate. Your task is to ask and be clear about your intentions, objectives, and goals. But ask. Lastly, build relationships with those in your industry. From the “Black travel movement” perspective (as it has so been coined), I have real and close relationships with many of my colleagues in the space. Notice, I did not say “competitors.” We all have similar missions, goals, and objectives. But to impact and move the needle for an entire demographic will take more than just one, two, or five brands. Partnering and collaborating with those in your industry will not only bring you more organic awareness but will allow you to cultivate a powerful network. Lastly, do yourself a favor and hire help! It’s inexpensive to hire a Virtual Assistant (VA) who can do the things you don’t want to do. The earlier you can get someone on your team that can help you in these aspects, the better! This will allow you to not only free up time but gives you the mental capacity to be creative and develop super compelling and valuable content. One of the best sites to get started with is Fiverr! Services start at $5 and surely you can afford that! Want to Learn HOW To Get Started As A Travel Influencer? Join This FREE Class!